I bought the first piece of art by Scott Smith that I ever saw. That statement is significant because I look at lots of art; however, I only buy a work of art when I find some connection that makes me long to possess it. I only buy art, in other words, that speaks to me in some way. Scott Smith’s art speaks to me. That first work that I acquired is called “Butterfly Wall” (pictured above). Like much of Scott’s art, “Butterfly Wall” combines found objects with prints on paper. A grizzled cracking piece of sturdy 4×4 with four rusty nails congregated near one end anchors the piece. On one side of the 4×4 is a slice of barely rusted tin with ridged edges top and bottom. On the other side of the 4×4 Scott has attached one of his stunning signature prints: in this case the metallic greys and dingy rust red inks blend and interact on paper that gracefully curves (I now know that the curving paper in “Butterfly Wall” is an anomaly in Smith’s work). 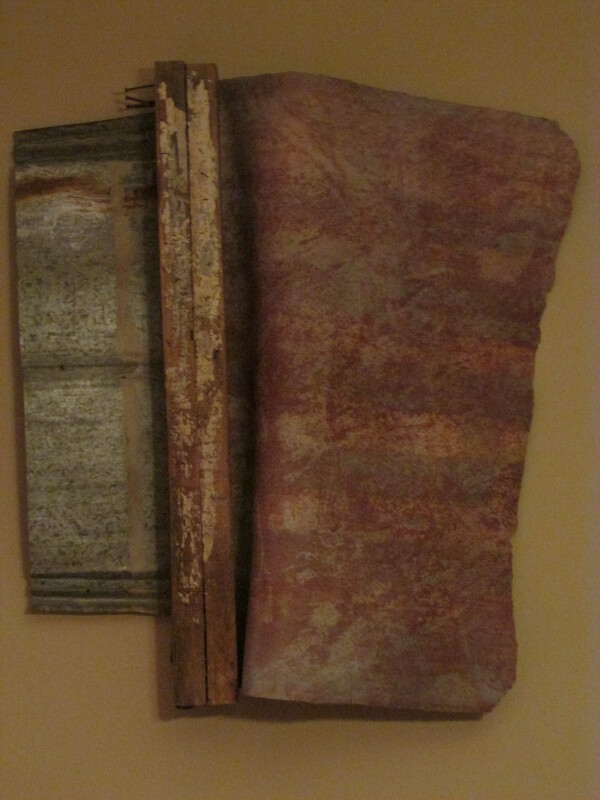 “Butterfly Wall” has gravity and presence and looks as if it should be very heavy but it is really very light. I am sure he did not intend the print as a trompe l’oeil but everyone who sees “Butterfly Wall” for the first time walks over and touches the graceful curve and is surprised to discover that the print is, well, a print. I knew Scott before I saw that first piece that I had to buy. I knew that Scott was a master printmaker and a mixed media artist and from our conversations I knew that we shared an affinity for some of the same types of art and artists. As Scott and I became friends I was pleased to learn that he has worked with some of those same artists we both admired. And now that I have had the opportunity to observe much more of Scott’s output first-hand over the past decade I feel that his is a singular vision. Many artists work with found objects; many artists make prints; many artists incorporate assemblage into their work. And Scott Smith has some things in common with many artists. But his vision seems unique to me. I haven’t seen another artist’s work that is quite like this. Scott is from the rust belt of Ohio and his fascination with industrial detritus is a fascination I share from growing up in Birmingham when it was still an iron and steel center. His concern with relics and castaways from the past never becomes sentimental or nostalgic. He recognizes the beauty in the margins and presents it at face value. It’s not just the industrial castoffs Scott is drawn to, however. Scott’s art embraces the decay and fading grandeur of rural as well as urban landscapes. This is part of the reason, I suspect, that his output takes on a local and regional flavor regardless of where he happens to find himself. In the years that Scott and his wife, Michelle, have lived in northern Alabama he has rescued castaway barn materials, architectural elements, and other found objects and incorporated them into his work and allowed them to inform and influence his prints. Scott takes the objects at hand, filters them through his sensibility, and makes them of a specific time and place but still transcendent. He’s hard to peg and that is another reason I find his work so appealing. “Aggressive,” “robust,” “masculine,” and “earthy” are adjectives I have applied to Scott’s work at different times. So I was a little skeptical a few years ago when Scott told me he was going to have a show at a small gallery in the idyllic Florida coastal community of Seaside. I am a somewhat grudging admirer of Seaside, Florida, and would be inclined to describe the town as “pastel,” “refined,” and “precious.” None of those are adjectives I would ever apply to Scott Smith’s work and I wasn’t sure how it would be received there. I traveled to Florida with Scott, Michelle, and their daughter, Cecilia, for the Seaside gallery opening and was surprised and delighted to find that not only did Scott’s art “play” in that environment, it was embraced by it and embraced it in return. The work took on a whole new and unexpected presence in Seaside. Neither the environment nor the art was compromised. Instead, each responded with a fresh vibrancy and timbre. That is the true mark of an artist and his art, isn’t it? Doesn’t it start with something personal and specific and of the moment and transform into something universal and transcendent? In Scott Smith’s work, the mastery and the marginalia fuse. This entry was posted in art and tagged fine art, Scott Smith on September 25, 2014 by gedwardjourney. Love the work. You should encourage scott to look at famous Australian artist Rosalie Gascoigne (now deceased) much loved. The work reminds me of his. Thanks, Anne. I looked up Gascoigne’s work and see the connection.